Always a fantastic show with lots to see over many halls. This year we were excited to bring to the show one of only 2 Capri's that took part in the 1970 London to Mexico City Rally. It didn't manage to finish the race but went out to acclaim in other rallys. Capri is under restoration so wasn't in full rally livery but we will be bringing this car to future shows . On our club stand was also a White 1971 Capri 3000E - one of the most sought after cars -but hey the Capri in any model is 'wanted' now- a- days. - This car was immaculate and has to be one of the best around. Our third car was a 1973 Sebring red 1600XL facelift, the owner loved it so much that when he sold it he missed it so much he had to buy it back. A lovely outstanding Capri in a colour that is so loved for its vibrance and warmth. As a club we were very proud to show these cars and to hear the public visitors, as well as other exhibitors say all manner of nice things about them. This years show overal was brilliant, we were happy to be part of the euthoria. It boasts the first 2600 bodyshell to be imported to the UK and powered by a 2600 V8 engine. We made it to Powderham Castle show near Exeter in August. This is a well supported show so lots to see. Booked in for two days but was disappointed to be told that Sunday was already booked out solid. We still went along withh my Mk1 on Saturday and the show was a buzz, loads of interest in the Mk1 - it is a bit of a rarity in these parts though our friend Dave was on his club stand with his super black 3000 model. It would be nice to get a club stand together at this event. What a great show this has turned into. We had quite a large stand to fill so arranged for 6 cars to be on show. However on the day we were down to 4 as 2 failed to make it to the show. One owner found that his car that had run so reliably for years stopped dead and refused to start again. He made frantic attempts to sort out the problem but had to admit defeat. another car had a radiator core fail - it was too late to be able to replace it. But we still had 4 interesting Capri's on show. A 3000E that had been bought in 1979, after being used as a get away car in a bank raid, has been languishing in a barn since purchase and there it had slowly got rustier and dirtier, waiting for the day it would be restored. It was bought out for the first time since 1979. In all those years it had not been fired up at all. After evicting a family of mice from the engine bay the owner set to to get the car fired up, a few tweaks and turns as well as fresh fuel in the carb bought the engine to life. The owner was able to drive it into the show, it was also fired up and driven onto the trailer at the end of the show, much to the surprise of onlookers. 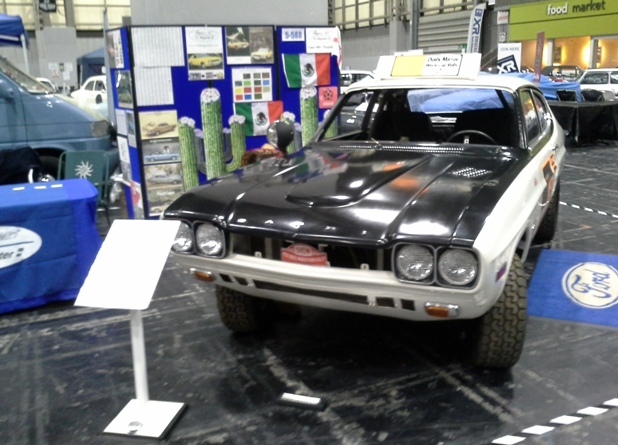 Another Capri - an ongoing project that has been serialised in the club magazine is a 3000Lt GXL, it was on the club stand bo last year too as a work in progress. The body work has been extensive as the rust worm had got into everything but with many hours of hard work it is looking pretty good now, and is moving ever nearer to the refitting of components - the interesting bit. This car was also being worked on during the show, the owner and his son undertook to rub back the body to get a smooth even finish ready for the primer coat of paint. Our totally complete and concours car was a V8 Perana muscle car built in South Africa by Basil Green Motors. This one was possibly one of the first imported to this country back in 1982, and bought by its present owner in 1988. the car has been well maintained and looked after in all these years. Our final car was the Ford prepared GXL racing machine found in recent years in a bricked up in a garage. Painted white it looked anything but what it really is. The new owner has worked very hard to give it a sympathetic makeover bringing it back to its racing livery and restored engine. An extremely rare beast. Driven by HRH Prince Michael of Kent in the first Tour of Britain and being driven for fords by the famous Tom Walkinshaw. The first person we met at the show on set up had actually worked for Tom and recognised the Capri immediately - what a lot there was to talk about. Its little wonder we were probably the last club to leave on set up night. 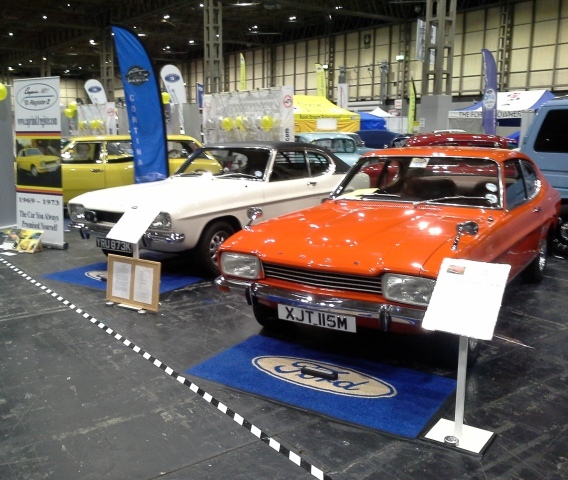 There were several other Capri's dotted around the show halls, some Mk3's for sale and some in need of restoration. We were in hall 7 on the edge of the show but we had plenty of footfall. People seemed to be making straight for the hall to start their tour and on seeing the Capri's stopping to spend time poring over the cars. Silverstone auctions had an awful lot of cars to sell this year, it was held over two days. Amongst the lots was a Mk1 Capri that was painted in Gunston racing colours - orange and brown. It was expected to make between £10000-£15000. The show has grown so much and is so interesting with barn finds and restoration work being undertaken on club stands as well as the Pride of Ownership with pristine cars. Well worth a visit.